Your Guide to Becoming a Freelance Web Designer provides an honest look at the ins and outs of starting your own freelance design business. You’ll learn the pros and cons of starting your own business, the responsibilities involved and the pitfalls of working on your own. This eBook is straightforward and written in an easy-to-understand manner. You don’t need to be a business expert to read it. 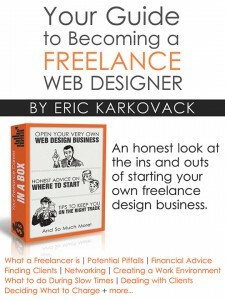 While the book is written with designers looking to launch their own business in mind, it also provides valuable advice to veteran freelancers. » Chapter 1: Why Become a Freelancer? Available in PDF or Amazon Kindle (.mobi) formats. Looking for the Amazon Kindle version? Buy it at Amazon!